Below are presented the Command Officers, Command Attaches and Advisors that comprise the upper levels of command in The Emperor's Hammer Strike Fleet. It is in a large part due to the hard work and effort of these fine volunteer officers that such a large organization is able to function as a cohesive club. URLs for all Offices are provided if available. 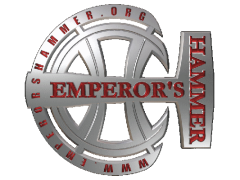 More detailed information can be obtained at the Emperor's Hammer Main Site or by reviewing the EH Training Manual. The Fleet Commander is the Club Manager and overall leader of The Emperor’s Hammer. The Fleet Commander is the one and only official liaison to the EH body and its Board of Trustees. He's also who appoints Command Staff Officers and Group Commanders (GCOs). In addition, the Fleet Commander's decision on ANY matter in The Emperor’s Hammer is final. Besides, the Fleet Commander should be also the main contact for anything related to the club as a whole (not necessarily related to any Group) for all non members, hence why an e-mail link is provided. The current Fleet Commander is Grand Admiral Rapier. Second in command, the Executive Officer contributes to development and management of The Emperor's Hammer and is in line for command should anything unexpected happen to the Fleet Commander. The Executive Officer also has supervisory capacities over ALL EH Groups on any matter. The Executive Officer edits "The Dark Sentinel" (EH official newsletter). The Executive Officer is also main contact for anything related to the club as a whole, either in absence of the Fleet Commander or not, for all non members. Moreover, since he's supervisor of all EH Groups he's also secondary contact for anything related to a specific Group in absence of that Group Commander (GCO). The position of Executive Officer is currently not filled. The Judge Advocate General performs the roll of Judge on any Emperor's Hammer Court. After managing all official procedures in accordance to the Emperor's Hammer Articles of War the Judge Advocate General finally reads the verdict and passes sentence on the accused and, if an expulsion from the club is warranted, passes that recommendation to the FC and XO for their consideration. Although Judge Advocate General is Support Staff for the Executive Officer, it's considered a Command Staff position. The position of Judge Advocate General is currently not filled. The Security Officer is responsible for the online conduct of Emperor's Hammer members. Being the internal "chief of police" for the entire Emperor's Hammer, the Security Officer has authority to monitor ALL forms of communication for EH Bylaws and IRC Code of Conduct violations. When an alleged violation has been noted, the Security Officer is to be notified and may review and present the case to the Judge Advocate General for prosecution. The Security Officer is main contact for anything related to possible violations of EH Bylaws and EH IRC CoC for all members of The Emperor's Hammer, no matter the Group. The position of Security Officer is currently not filled. The Internet Officer is directly responsible for maintaining the Main Emperor's Hammer WWW Links Site, which serves as a central link for ALL EH related links/pages in the Fleet (i.e. Group specific main sites). The Internet Officer also looks for new areas of exposure and opportunities for The Emperor’s Hammer on the WWW and assists members on the creation of Emperor's Hammer sites as necessary, also doing periodic checks on such sites to make sure they're in working order and follow Fleet standards. The current Internet Officer is High Admiral Zsinj. Command Attache to the Internet Officer (CA:IO / CA-4) is: Admiral Jedi Eclipse. The Communications Officer is primarily responsible for maintaining all Emperor's Hammer Internet Relay Chat (IRC) channels, enforcing EH IRC Code of Conduct, and responding to members complaints and concerns. Additionally, ANY member having trouble trying to reach his immediate commanding officer may contact the COMM for assistance. The Communications Officer is also responsible for attending Emperor's Hammer IRC meetings and keeping logs of them. Although Communications Officer is Support Staff for the Internet Officer, it's considered a Command Staff position. The position of Communications Officer is currently not filled. The Training Officer oversees all aspects of training within The Emperor’s Hammer. This spans from initial helping of recruits for them to meet their entry requirements to the running of Imperial University and other academies, for the Training Officer oversees other Group specific academies and their training staff. In addition, the Training Officer maintains the Emperor's Hammer Training Manual. Besides, the Training Officer is also the main contact for anything related to joining The Emperor's Hammer for all non members, hence why an e-mail link is provided. The current Training Officer is Fleet Admiral Tomaas Montte. The Tactical Officer assists all members of The Emperor's Hammer, no matter the Group, on creating/installing new custom missions and battles for Emperor's Hammer sanctioned game platforms, also evaluating and fixing them as necessary before they get released. The Tactical Officer is responsible for maintaining the Emperor's Hammer Mission Compendium and also maintains the Fleet Commander's Honor Guard system (FCHG) and the Battle Board for the TIE Corps Group, documenting high scores achieved on completion of official Emperor's Hammer custom battles for flight-based game platforms. The current Tactical Officer is Admiral Pickled Yoda. The Science Officer is responsible for maintaining the Emperor's Hammer Patch Archive and Fleet Manual, providing evaluation, correction and final approval for all new patches. The Science Officer must approve all Emperor's Hammer fighter, transport and capital ship designs. He also maintains the Order of Battle and is responsible for being current and knowledgeable on upcoming gaming technologies for the Star Wars genre. Although Science Officer is Support Staff for the Tactical Officer, it's considered a Command Staff position. The current Science Officer is Admiral Impulse. The Logistics Officer acts as chief archivist for The Emperor's Hammer and is responsible for maintaining duplicate copies of ALL EH official documents. The Logistics Officer also oversees the "Imperial Census", which gathers information about the membership and other factors of the Fleet. Additionally, the Logistics Officer is the main responsible for maintaining and updating "Encyclopaedia Imperia", the Emperor's Hammer WIKI. The current Logistics Officer is Fleet Admiral Mark Schueler. The Recon Officer is tasked with recruiting new members as well as keeping the public at large informed about the activities of the Emperor's Hammer. The Recon Officer helps to maintain the social media presence of the EH and also provides assistance with media projects for the subgroups such as the creation of video content or setup for live streaming for supported games. The current Recon Officer is Admiral Miles Prower. These positions were created to fill specific jobs that cover several sections of The Emperor's Hammer, or which do not fall under the specific jurisdiction of any Command Officer or Group Commander. All in all they're basically counselors whose advice is considered of critical importance for The Emperor's Hammer Strike Fleet, and are considered Command Staff positions. Princeps of The Emperor's Hammer Strike Fleet, also meaning "First Imperial Citizen", is reserved for the Founder of The Emperor's Hammer (December 1994), who is also the legal Owner of the club and president of its Board of Trustees. He was also the first Fleet Commander of The Emperor's Hammer. However, since Princeps is not the Club Manager anymore, the Fleet Commander should be addressed instead for anything related to the club. The Princeps of The Emperor's Hammer is Grand Admiral Ronin. Imperial Sovereign Protector is reserved for a dedicated Emperor's Hammer officer who has been chosen to guard and protect the Fleet Commander from any external forces, serving the FC as main counselor. Currently it's working as a position for an officer whose vast experience and time in service qualifies him to act as main advisor, along with the Princeps, for the whole club. The current Imperial Sovereign Protector is Grand Admiral Cyric.